Introducing the participants and the organizing team. A poem recitation about the festival, written and cited by Amna Thakir Al-Iraqi. – photography exhibit – featuring the photographer: Ali Al-Baroodi, Laith Mohammed, and Ahmed Al-Hayiali. The exhibit consists of about 60 images, displayed in the walkway opposite to the library, some are colored and others in black and white. Each image is with a story and the photographers Will tell their stories. – An open painting gallery, participating painters: Rahma, Issam, Abdurahman, Younis, and Mohammed. They will paint their vision of the festival. – A music concert: participating players: Mohammed on Violin, Khalid on Oud, Al-Hakam on Guitar, and Mohammed on Guitar. – Donation: Announcing the beginning of donation receiption from doners. Every guest carries a book and walk to the alternative location in a straight line to transport the books. 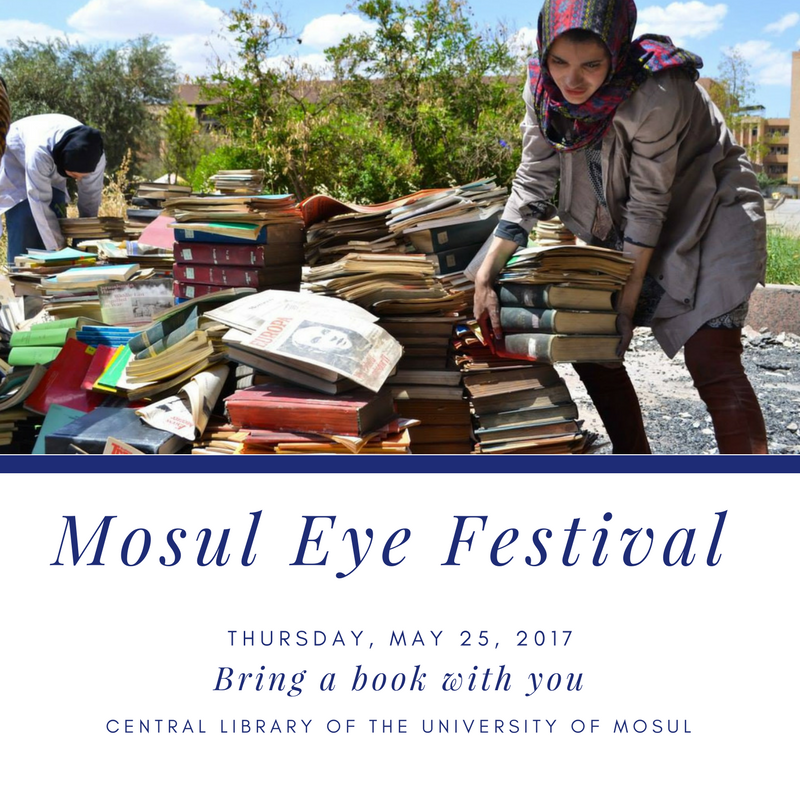 Note: the entrance fees to the festival is a book that you can leave your touch in renovating and reviving Mosul’s libraries. Please be generous to be remembered for as long as your book’s existence. I heard about this effort via a Facebook post from Buzzfeed. My son fought in Mosul in 2008 for the US Army. How may I help from the US to collect and send books for your library? What kinds of books do you need/want? New, used, OK? Thank you! Hello! It could be fine to have an address to send book from others country. I’m an italian architect from Sicily, but living in Barcelona, Spain. It would a pleasure for me to contribute sending some italian or spanish book. What do you think? Yes, I was just thinking the same. If we can send books how can we do this? Mosul Eye. If librarians to assist librarians and readers in Mosul is there a way to do so ? Stephen, Fremantle Western Australia. I have heard that once there was a great library in Iraq and crusaders throw lots of hand written books in river.. And water turned into colour of ink… Not sure if that is true.. But my point is once Iraq was a sacred place of learning but now a war zone. I am trying to write about Rohingya Muslims.. But not yet finished as the more I read about the atrocities the more I am heartened..